On Wednesday, the first session of the Project Based Learning group that I’m hosting met in SLA’s Library. Going into the session, people had already read a short intro essay about Understanding by Design. We started by introducing ourselves and describing our teaching environments. I’m thrilled to have people from all grade levels and disciplines, and even two people doing special instruction via a non-profit! A big goal of this ItAG is to help people create lessons that work in their environment, no matter what that is. Folks looked at the chart and read the accompanying descriptions for each skill, and had time to reflect on what they were already doing well in their classrooms, and what they were worried about. How do you deal with group work? Some kids will refuse no matter what. How do you get them to see the value? Extra time will be devoted to this in a future session. Making it public is difficult. How do you do that? How do you get projects to be above being a poster? How do you get kids to take ownership? Getting them to go out on a limb – what’s the right answer? how many points is this worth? How do you prevent them from shutting down? 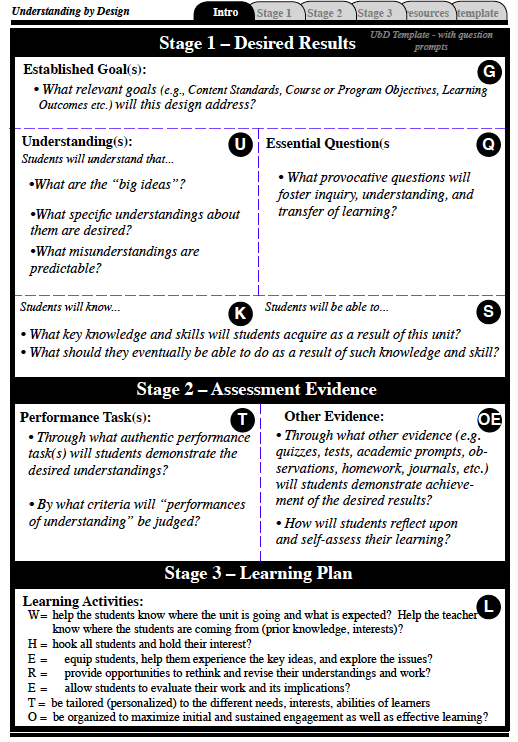 We then took a look at a Template PDF which introduced the basics of Understanding By Design lesson planning. I strongly recommend that you download the whole document, but here’s a snapshot of what we did. Next, we looked at a “before and after” series, first looking at the “original” plan and discussing what we thought the essential questions for this project could be, and how that might change the overall design of the unit. Once we had teased that out, we looked at the “transformed” lesson. The second example was for a high school geometry class — a valuable discussion because we hit our heads against the conflict of what makes math “interesting” — the math itself, or the social implications of it? Several of us were very interested in the connections that the unit was making to geography and packaging, but were reminded (by the math teachers in the room) that this is often a flaw in “selling” math to students — that everything BUT the actual math is presented as the cool stuff. PBL is more about the “how” than the “what” — so the lesson plans should be focused on the process, not the final product. Therefore, PBL can (and should) teach explicit skills to students — how are they going to create that what? Explicit skill instruction is NOT forbidden, and often necessary in PBL. That can include looking at textbooks, or giving quizzes or tests. 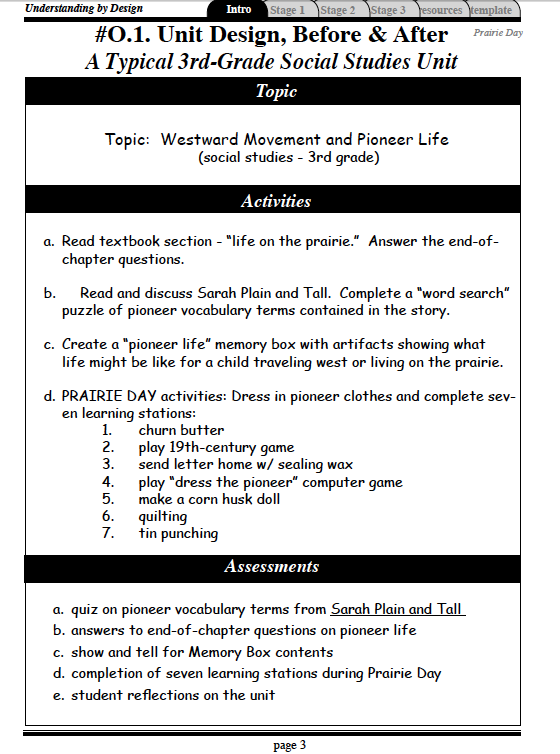 The point is that these activities are formative, not summative. Lastly, the take-home task: pick a unit that you would like to make PBL — either one that you already teach, or a new one to design from scratch. If you’re feeling motivated, start to brainstorm what your essential questions would be! If you are following along at home, please post your lesson plan in the comments, as well as any questions or thoughts you have. This entry was posted in Uncategorized on February 14, 2013 by lpahomov. Great resources here! I’m not currently in the classroom – I work in a district office – but planning a PBL will be good practice for me both for helping other teachers, but also for my return to the classroom. I totally agree with the comment about the moniker 21st Century Skills. I tell my students that they worked pretty well in the 20th Century also! My challenge is that I teach “21st Century Skills” – with a curriculum I have been developing based on our district Information and Digital Literacy Framework and of course the Common Core. I call it a challenge because I have no traditional content, except teaching them to use information research tools effectively, and efficiently. It really should be integrated and not a standalone. I work on Internet safety and digital citizenship, but to teach them research, we really need to research. 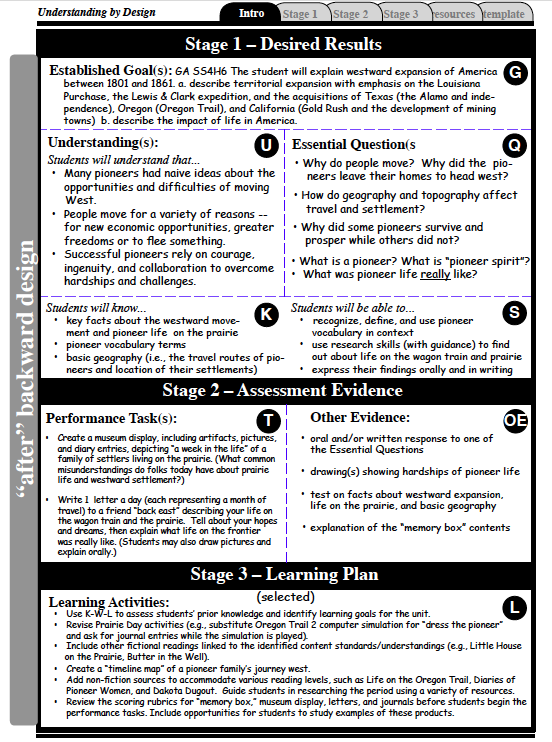 I absolutely LOVE the idea of PBL! . As a teacher of students with special needs, it is often difficult to impossible to ask/require students to write or speak about a particular topic. PBL allows the student to demonstrate curriculum understanding in a way that is comfortable and meaningful.